2017. Öhman, Places and Peoples: Sámi Feminist Technoscience and Supradisciplinary Research” in Sources and Methods in Indigenous Studies, eds. Chris Andersen and Jean M. O’Brien, Routledge. 2017. Henrik Andersson och May-Britt Öhman. Var dag en kamp för skogssamisk framtid: Ett (drygt) år med Henrik Andersson, renskötare i Gällivare skogssameby –Uppsala mitt i Sápmi – Sábme – Saepmie II, Öhman, Hedlund och Larsson (red.) Uppsam:s skriftserie 2, Uppsam, Uppsala, 51-62. 2017. Öhman, Kolonisationen, rasismen och intergenerationella trauman: Analys, reflektioner och förslag utifrån ett skriande behov av samiskLEDD forskning och undervisning, Uppsala mitt i Sápmi – Sábme – Saepmie II, Öhman, Hedlund och Larsson (red.) 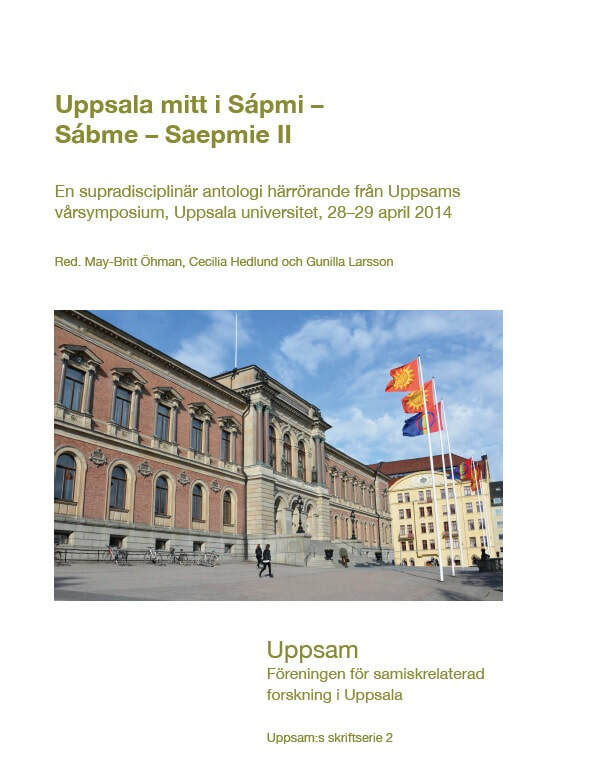 Uppsam:s skriftserie 2, Uppsam, Uppsala, 99-113. 2016. Öhman, M., Palo, M., Thunqvist, E. Public participation, Human Security and Public Safety around Dams in Sweden: A case study of the regulated Ume and Lule Rivers. Safety Science Monitor, Royal Institute of Technology, Stockholm. 19(2), 8. 2016. Öhman, Embodied Vulnerability in Large Scale Technical Systems – Vulnerable Dam Bodies, Water Bodies and Human Bodies, Käll, L. F. (ed.) Bodies, Boundaries and Vulnerabilities. Springer. 2010. Öhman “‘Sweden Helps’: Efforts to Formulate the White Man’s Burden for the Wealthy and Modern Swede” Kult 7 - Special Issue. Nordic Colonial Mind, Roskilde Univ., 2010, 122-142. 2009. 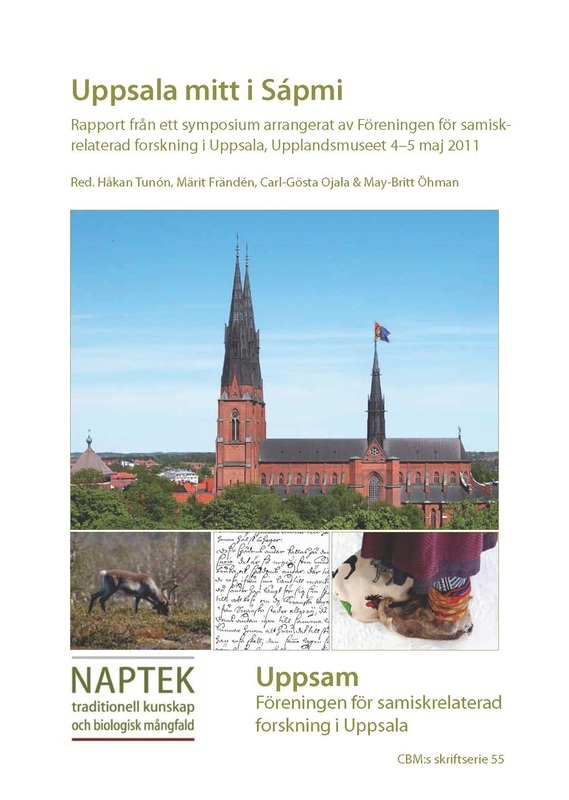 Öhman.”Grön el och kolonisationen av Sápmi”, Genus i Norrsken, 2009(2):3-8. 2006. Öhman. “On Visible Places and Invisibilized Peoples: Swedish State-supported Hydropower Exploitation of Indigenous Peoples’ Territories”, Baraldi et al. (eds), Taking Place Sagamore Beach, 189-221.
eds. Johan Gärdebo, May-Britt Öhman, Hiroshi Maruyama, 2014. Kan köpas från/ Buy from Amazon.com, Adlibris (e-book) and from UPPSALA MULTIETHNIC PAPERS, Hugo Valentin Centrum, Uppsala universitet. Or send request directly to may-britt.ohman@gender.uu.se (SEK 350 incl. postage) .Vänligen skriv/ Please write "Re-Mindings request" på ämnesraden/ in subject line. RE: Mindingsbrings together indigenous scholars, artists and activists, and indigenous allies to speak of whose positions, contexts and experiences it is that inform the construction of knowledges, histories and sciences. In short, whose experience counts? The purpose of RE:Mindings is to encourage its authors and readers to investigate what it means to resist exploitation of humans, non-humans and nature within the frames of modern nation states. Examples are provided from communities within or across the borders of existing nation states: Sámi and Saepmie/Sábme/Sápmi in Fenno-Scandinavia; Aboriginal–Martu in Australia; Ainu people in Japan, Dakota–Native Americans in USA and Mapuche in Chile. 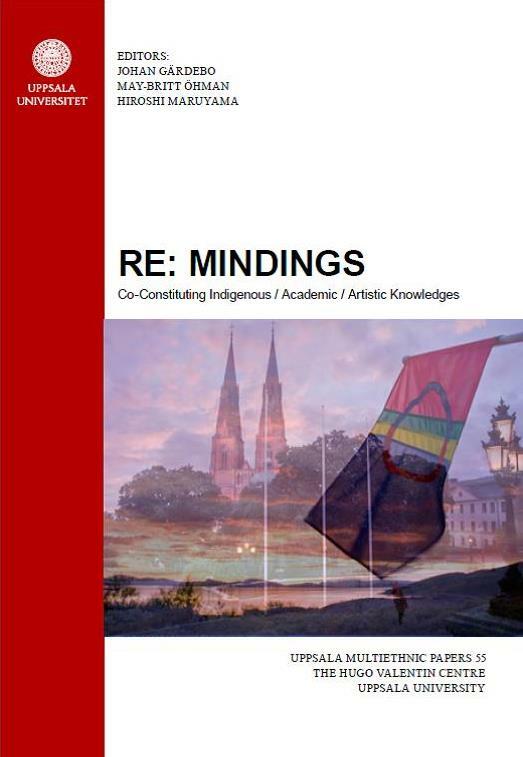 This publication originates from the supradisciplinary symposium RE: Mindings; Co-Constituting Indigenous/Academic/Artistic Knowledges and Understandings of Land-, Water-, Body-, and Lab-scapes, held at Uppsala University, 10–12 October 2012.